Although outstandings for the largest issuers continue to decline, there is evidence that these issuers are now at a inflection point, where growth in new vintages is starting to exceed declines in run-off portfolios. Chase claimed that it reached this inflection point in the second quarter of 2013, and expects to generate moderate outstandings growth this year. Bank of America is pointing to strong growth in account production, with 1 million new accounts opened in each of the past two quarters. Discover and American Express both increased outstandings by 4% y/y; this led to net interest income growth, of 10% and 8%, respectively. Wells Fargo grew average outstandings 8%, as it grew new accounts by 29% y/y . 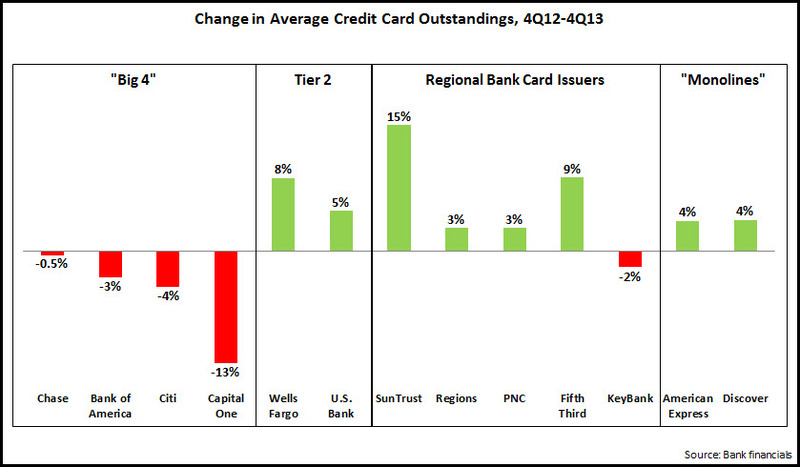 Credit card penetration of Wells Fargo retail banking households rose from 27% in 1Q11 to 37% in 4Q13. As there is growing consensus that the economy will grow robustly in 2014, improved consumer confidence should translate into increased credit appetite, which issuers will look to meet with targeted campaigns and pricing (on introductory rates rather than go-to APRs). In addition, in recent years, issuers have focused on higher FICOs (which we discussed in a recent blog), but now may look to develop campaigns, product and pricing for other segments. The 7 issuers reporting annual volume data generated an increase of 8% between 2012 and 2013. Growth in volume continues to outstrip outstandings, as debt-wary consumers continue to see the credit card as more of a payment than a borrowing tool. In general, issuers grew volume from a combination of new account production and increased existing cardholder spending. American Express’ 9% growth was boosted by a 12% increase in small business spending, marking the fourth consecutive quarter of double-digit growth. In 2014, issuers will be looking to benefit from growth in consumer spending as the economic recovery takes shape, so we should expect a continuation of tiered earnings in rewards programs, as well as communications and offers targeted at key stages of the cardholder life cycle (card acquisition, activation, retention and ongoing card usage). Charge-off rates for many issuers are at or below historic lows, with all issuers reporting 4Q13 rates below 4%. In the aftermath of the financial crisis, some of the leading issuers experienced huge spikes in their charge-off rates. The charge-off rate for Bank of America’s U.S. Card unit rose to more than 14% in the third quarter of 2009, while the rate for Citigroup’s Citi-Branded Cards-North America unit peaked at 10.78% in 2Q10. The chart above shows that charge-off rates for these issuers have returned to normal levels. Low charge-off rates—and the expectation that these rates will remain low—enable issuers to maintain reduced loan loss provisions. This in turn boosts profitability even as issuers struggle to grow revenues. 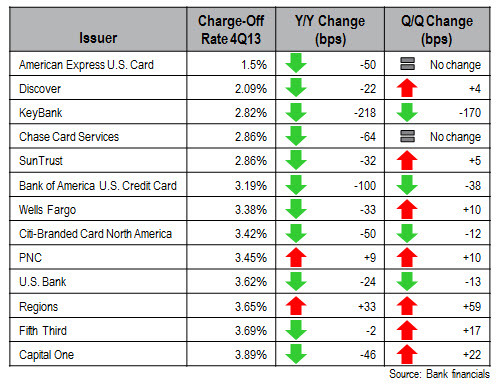 Some of the leading issuers reported strong y/y declines in provisions in 4Q13, including Chase (-46%) and American Express (-27%). As issuers push for outstandings growth in 2014, the expectation is that charge-off rates will rise. However, there are indications that rises in charge-off rates will be moderate. 30+ day delinquency rates (leading indicator for charge-off rates) continue to fall. In addition, the credit card sector has changed fundamentally in recent years; neither consumers nor issuers see credit cards want to return to the borrowing/lending culture that pertained prior to the financial crisis. 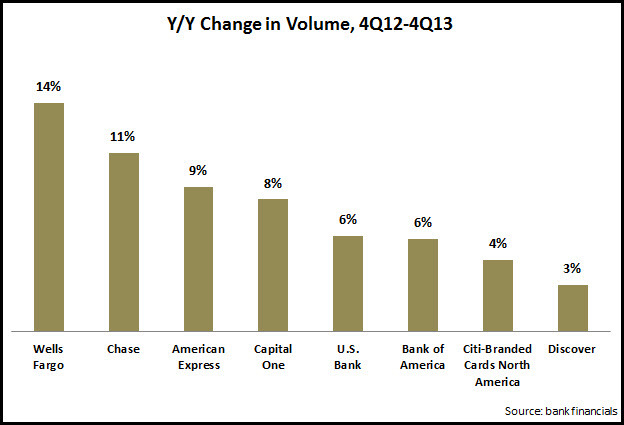 An analysis of 4Q13 and full-year 2013 financial results for the leading U.S. banks reveals that most are continuing to reduce their marketing spend. This is being driven by both economic uncertainty as well as banks’ long-term desire to cut costs and maintain profitability as they struggle to generate revenue growth. Of the 12 banks studied, 8 reduced marketing spend between 2012 and 2013, with 5 of these cutting budgets by more than 10%. Taking a longer term view, 8 of the 12 banks increased their marketing expenditure between 2008—when the financial crisis hit—and 2013. At first glance, this would imply that banks have ramping up their marketing spend in recent years. However, many of these banks have changed dramatically during this period, mainly through acquisition. For example, Wells Fargo acquired Wachovia, Chase bought Wamu, and PNC purchased both National City and RBC Bank. So, to ensure that we are comparing like-with-like, we need to look at “marketing intensity”, which we define as the ratio of marketing spend to net revenue. In 2013, there was a broad disparity in intensity for the various bank categories: highest marketing intensity (>8% of revenues) for branchless monolines, which have no branch networks and which are overwhelming focused on selling credit cards; lowest intensity for regionals (<2% of revenues); and megabanks tend to spend 2-3% of revenues on marketing, with the notable exception of Wells Fargo. Capital One is a monoline/branch bank hybrid, with a branch network but also a continued high dependency on credit cards; this is reflected in the 6% of revenue it devotes to marketing, higher than traditional branch banks, but lower than monolines. So, even though 8 of the 12 banks increased their marketing expenditure between 2008 and 2013, during this period, 9 of the 12 banks reduced their marketing intensity levels. It is notable that the two “banks” with the highest marketing intensity—American Express and Discover—have both increased in intensity over the past five years. On the other hand, the largest decline was recorded by Capital One, which has been transforming itself from its credit card monoline to full-service bank. As there are now signs that economic recovery is gaining strength, increases in consumer and business confidence should translate into a greater demand for financial revenues and opportunities for banks to grow revenues. However, the need for increased marketing investment to capture business growth will be battling against banks’ cost-cutting culture that has become in recent years.